The U.S., Australia, and the Netherlands each exported more than $2 Billion USD worth of fresh bovine meat in 2015. Meat packers preparing beef for export. Meat derived from cows is known as beef. Two types of beef are imported and exported around the world, fresh beef, and frozen beef. This article will discuss how fresh beef is produced, processed, and shipped. It will also cover the uses of fresh beef and conclude with the countries that import fresh beef worldwide. There is a variety of ways that cattle are raised for the future production of beef. There are the free range, organic and ranching techniques that are used to raise cattle. However, the technique that is mostly used in modern cattle raising is called intensive animal farming, which is the method this will cover. The first step in this process is called weaning where the calf is introduced to its adult diet and is taken off its mother's milk. The second step is called backgrounding in which the cattle then spends its time grazing in a restricted area to increase the cattle's weight and help it build up immunity to diseases. Then the cattle are transferred to the last step in the process, the feedlot. The feedlot is designed to have significant weight to the cattle as fast as possible by feeding them a high protein diet of mostly corn and soy. Cattle are also injected with growth hormones and antibiotics during this period to build up more muscle mass. Once the cattle have reached their finishing weight, they are transported off of the feedlots by truck to go to slaughterhouses to be processed into beef. Before processing starts, the cattle is examined to make sure it is fit for human consumption.If the cattle is deemed fit, it goes to the next step in processing cows called stunning. The cattle are put into a stunning box and have a captive bolt fired into their heads to induce physical shock, which causes them to become unconscious. In this unconscious state, it is easier for the cow's throat to be slit humanely. It also allows the blood to drain from the carcass in a way that does not affect the carcasses' meat. Then the carcass has its hide removed and is decapitated. The carcass is opened up to undergo the process of evisceration, where its insides are removed. The carcass is also inspected again in this process to make sure it is safe. Next, the carcass is cut in half and sprayed with water to remove any blood and bone chips. After that, the carcass is hung in a cooler for a week to age the beef and lastly it is cut into whatever end beef product is intended with the help of a processor. Fresh beef products have a limited shelf life and should be transported to their destination within a few days of being processed. Fresh beef is most commonly transported by truck and should not normally be transported over long distances. 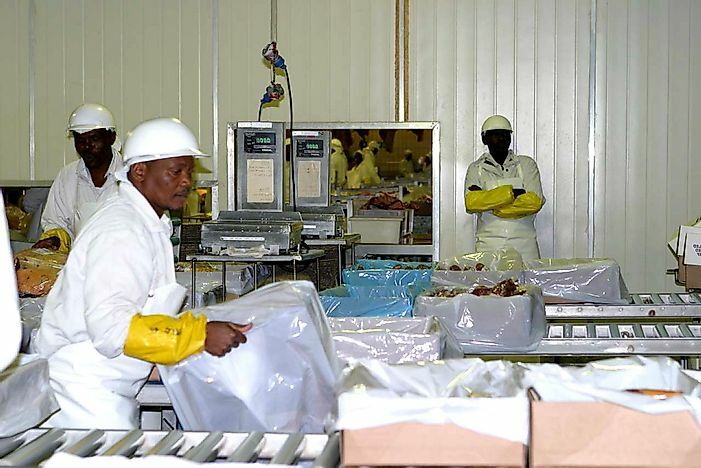 To ensure the fresh beef being safe to eat during transportation, it should be put packaged into boxes or crates before transportation and checked to ensure the packaging is stable. Human contact should be avoided when fresh beef is being transported. The beef should also be kept at the proper temperature when being transported to ensure freshness of the meat. Fresh beef can be cut into a variety of different cuts of meat that any meat eater is familiar with, like roasts, short rib, filet mignon and sirloin steak, just to name a few. Fresh beef can be used to make a wide variety of dishes, like hamburgers, beef Wellington, meatloaf, pot roast, goulash and many more dishes. Beef may also be prepared in different ways to give it a different taste and texture, like broiling the beef as opposed to barbecuing it on the grill. The Observatory of Economic Complexity (OEC) states that the US and Italy are the world's leading importers of fresh beef. Together, these countries import 11% of the total beef in the world. The other countries that import over five percent of the world's fresh beef are Germany (8.9%), Netherlands (7.6%), Japan (7.2%), France (6.5%) and the United Kingdom (6.0%). The world's top importers of fresh beef in regions not already covered are Chile (3.6%) for South America, Algeria (0.73%) for Africa and New Zealand (0.18%) for Oceania.